The green bean, also known as the snap bean or string bean, is a type of bean that is eaten with the pod. Green beans are normally eaten fresh or nearly fresh, not dried. These beans are often called string beans because a fibrous string runs along the seam of the bean. The string becomes noticeable as the ends are snapped off. The snapping noise is the source of these beans' other name. 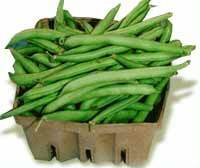 Fresh green beans are available all year, with a peak season of May to October. Green beans are also available canned and frozen. It is best to hand-pick green beans from a market that sells them loose. To ensure uniform cooking time, select beans of similar size and shape. Choose slender beans (no thicker than a pencil) that are crisp and free of blemishes. The beans should be a bright green color. Do not purchase beans that are stiff or have the seeds visible through the pod because those beans will be tough. Keep green beans dry in a perforated plastic bag in the refrigerator. They should stay fresh for 4 to 5 days. Wash beans thoroughly in clear, cool water. Beans can be cooked whole, cut crosswise or diagonally, or French-cut (i.e., cut along the length of the bean). If you want sweet tasting, crisp fresh beans, cut them as little as possible. Cut older, more mature beans in the French style (i.e., lengthwise). Stir-frying is one of the easiest ways to prepare green beans. This method maintains more nutrients than other cooking methods. Whatever cooking method you choose, remember to cook beans as little as possible, using the least amount of water possible. Boiling, steaming, and microwaving are other common methods for preparing green beans. When boiling, beans may release some nutrients into the water, so try to re-use the bean water to regain some of the nutrients lost. For example, you can use the water to boil rice. This page was last edited on 4 April 2007, at 16:40.